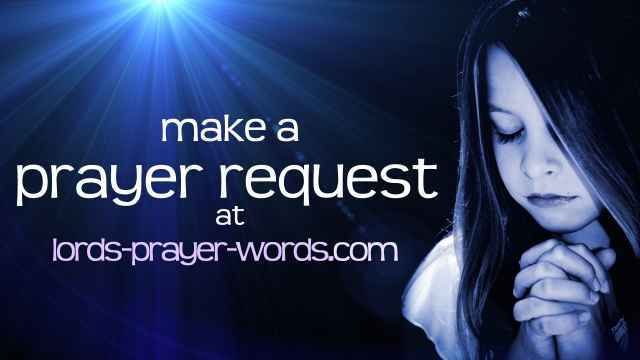 Welcome to Lords-prayer-words.com	... an extensive resource of traditional and contemporary Christian prayers. Central to this site is The Lord's Prayer, as this is where Jesus, the great master and Lord of all, teaches us how to pray. Here you can discover many versions and translations of this famous prayer, as well as commentaries and interpretations on the "Our Father" by several classic biblical scholars and theologians. The site is also packed with other free resources on prayer - with videos to meditate on and several hundred prayers on topics such as healing, strength, prayers for children and for various times and occasions. This section features the writings of three famous biblical theologians (Matthew Henry, Adam Clarke and Albert Barnes). www.lords-prayer-words.com is rooted in traditional Christianity, and upholds the Nicene Creed as it's statement of faith. The content of this site seeks to reflect the writings of the various streams and denominations that exist within the present day Christian faith and to do so in a non-partisan way. In this section of the website, we explore the Lord's prayer message and application through a number of well known biblical scholars and writers. The study by John Wesley considers that the prayer may be broken down into three sections - it contains a preface ("Our Father"), petitions ("Give us this day" etc), and a conclusion (the doxology). In the notes from Charles Spurgeon's sermon on the Lord's prayer, he considers that this text is a model for prayer, rather than something to be recited word for word. For example, when considering our sins, time needs to be taken to cite our wrongdoings and name them. Spurgeon goes on to observe that the prayer is "Our Father" - there is a double relationship in the text, firstly with God as Father, and secondly with our brothers and sisters (the prayer is not "My Father"). He asks us to think about the wider meaning of this - that the poor, the outcast etc are all our brothers. The	basis for the second sermon by Charles Spurgeon is Matthew 6:10 - "Your will be done on earth as in heaven". Here he considers the will of God, that it was originally perfectly done (in Eden), and in the future will be. In the meantime, as we pray this prayer, we are to commit ourselves to doing the will of God on earth. In this section you will also find an interpretation of the Lord's prayer by Alexander MacLaren. If you need some ideas for studying this prayer in your Bible group, then there is also an excellent contribution by Phil Harper. Here you'll find some thoughts on what motivates us when we pray, and how we might seek to do the will of God as a community together. www.lords-prayer-words.com began as a small project in 2007 with the aim of developing an online resource for people seeking to find out more about the Lord's Prayer. Initially this covered popular versions of the prayer and classic commentaries by the likes of Matthew Henry and Adam Clarke. The site was later added to by an extensive list of versions in different languages, (such as Russian and even Chinese!) and other resources, such as popular adaption's of the Lord's Prayer in music and song. The website has since grown to become a wider resource about prayer, and seeks to encompass the rich heritage of the Christian faith, from the prayer life of the ancient Celts to modern day writings of the contemporary Church, and from across the varied traditions that exist within it, such as the Catholic, Anglican, and Methodist church denominations The site now covers many famous prayers, such as the "Serenity Prayer" and "The Lord is my Shepherd", as well as a section on how to pray to God and various prayer topics (for example, prayer for children, health and healing, work and family life). This site now also has a dedicated page for posting your own prayers, for whatever situation you are currently facing - such as prayer for a new job, or financial or health concerns etc. You can visit this page by clicking here. a modern version of the prayer together with a lesson for children with activities and questions. a collection of commentaries and sermons about the 'Our Father' by famous biblical scholars. traditionally known as the "Prayer of St Francis" , Britain's Got Talent singing sensation Susan Boyle brought this song (and prayer) to a new audience with her no1 selling album "the gift". are you in need of comfort or healing? Peace or forgiveness? If so, here is a selection of links to prayers that might help you now.